In 2015, Gooding & Company sold 44 cars for more than $1 million each and with $206 million in sales had its best year ever. Gooding’s top result of 2015 was at Pebble Beach where a 1961 Ferrari 250 GT SWB California Spider sold for $16,830,000 narrowly beating the 1961 “Sharknose” Ferrari 250 GT SWB Berlinetta Speciale that sold for $16,500,000 at the same auction. These were the highest two result ever achieved at a Gooding auction. A further notable result was for the Le Mans-winning Rothmans 1982 Porsche 956 that sold for $10,120,000 – a new marque record. Gooding & Company reported its 2015 year-end auction sale total of more than $206.5 million with a 90% sell-through rate for 305 lots sold, averaging over $675,000 per car. The 2015 year-end total is the highest ever for the auction house and a very strong result for a company staging only three auctions per year. Gooding & Company sold 44 cars over $1 million and realized 58 world auction records in 2015 for a variety of blue-chip collector cars, heavily weighted by examples from Ferrari and Porsche. Additional top results were realized for historic automobiles from Mercedes-Benz, Bentley, Packard, and Rolls-Royce. The auction house’s top sales this year were the 1961 Ferrari 250 GT SWB California Spider that sold for $16,830,000, the 1961 “Sharknose” Ferrari 250 GT SWB Berlinetta Speciale that sold for $16,500,000, the Le Mans-winning Rothmans 1982 Porsche 956 that sold for $10,120,000 (a double world record for both the marque and a 956), the 1959 Ferrari 250 GT LWB California Spider that sold for $7,700,000, as well as the 1960 Porsche RS60 that sold for $5,400,000. The aforementioned Porsche 956 truly speaks to the rise in demand for Group-C competition cars with celebrated provenance, legendary drivers and distinguished liveries. These sales validate the auction block as the premier avenue to present renowned and historic collectibles, especially with regard to the top offerings from the Porsche and Ferrari marques. These three cars were among the top 10 most-expensive cars sold at auction in 2015. Gooding & Company has auctioned off more than $30 million in collector cars over the years supporting charities and foundations around the world. At the Scottsdale Auctions in January, a meaningful charity lot was presented from famed car collector and comedian Jay Leno. Leno’s personal 2008 Dodge Challenger SRT8 hammered at an astonishing $360,000, and the crowd roared with excitement as bidders donated an additional $200,000 in donations for a total of $565,625 in contributions to the USO. This expression of generosity was one of the most exciting bidding displays during the Arizona auction week. The overwhelming generosity of our clients was further accentuated in August at the Pebble Beach Auctions when Jay Leno personally drove and presented a 2016 Ford Shelby GT350, autographed by President George W. Bush, across the auction block. The Shelby GT350 realized a price of $700,000. Then, attendees rushed to make additional donations totaling $185,000, which resulted in $885,000 in proceeds to benefit veterans on behalf of George W. Bush Military Service Initiative. In addition to the 2016 Ford Shelby GT350, proceeds from the sale of the 1957 Ferrari 410 Superamerica Series II Coupe, which sold for a record-breaking price of $5,087,500, went to benefit the Wayne and Marilyn Nelson Foundation. This important foundation assists in the educational opportunities of America’s youth on their path to higher education, from financial assistance for elementary schools to funding college scholarships. Gooding & Company’s achieved a strong 90% sales rate at the 2015 Scottsdale auctions. Ferrari and Porsche led the auction spotlight; a 1962 Ferrari 400 Superamerica Series I Coupe Aerodinamico sold for an impressive $4,070,000 and an exceptional 1966 Porsche 906 Carrera 6 sold at $1,980,000. 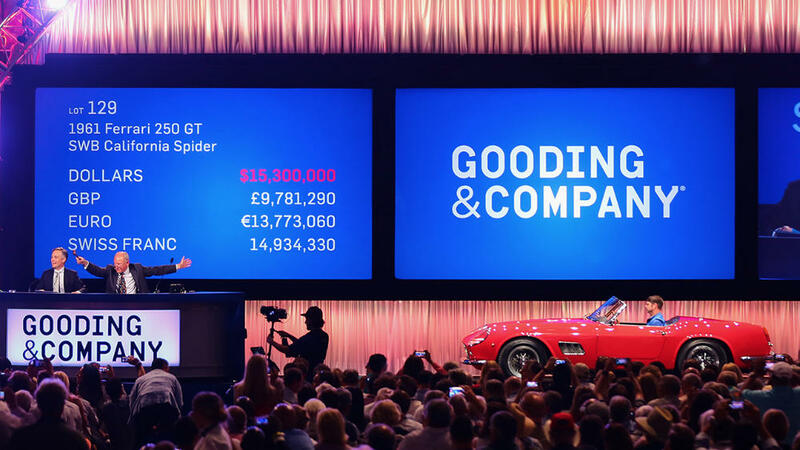 At the Amelia Island Auction, Gooding & Company presented an impeccable 1967 Ferrari 275 GTB/4, which sold for $3,300,000, and confirmed that Ferrari demand continues to dominate the market. Limited-production sports and racing cars, especially from Porsche, also performed extremely well. The stirring moments of the day included two limited-production examples of the iconic 911 series: a 1974 Porsche 911 Carrera 3.0 RSR, formerly owned and raced by Héctor Rebaque, that sold for $1,237,500, and an exclusive 1996 Porsche 993 GT2 that sold for $973,500, highlighting the widespread demand for high-performance Porsches that resonate with a new generation of collectors. At the 2015 Pebble Beach Auctions Gooding & Company posted its highest-ever average price of $1,113,896 per car, with an impressive 89% sales rate. There were numerous highlights throughout the weekend, including the one-off 1962 “Sharknose” Ferrari 250 GT SWB Berlinetta Speciale, a coach-built masterpiece from Nuccio Bertone, which commanded a world-record price of $16,500,000. The top selling car of the weekend and the year was the Ferrari Classiche-certified 1961 Ferrari 250 GT SWB California Spider, one of only 37 examples ever built, that resulted in a sale total of $16,830,000 — a single lot record for Gooding & Company auctions. Additionally, bespoke vehicles performed well, such as the charming, nautical-inspired 1956 Fiat Eden Roc, which commanded a price of $660,000 after a captivating bidding war. Other notable sales that electrified the auction tent were the stunning 1957 Ferrari 410 Superamerica Series II Coupe, formerly owned by Princess Soraya of Iran, that sold for $5,087,500; a 1965 Ferrari 500 Superfast that sold for $3,025,000; and a 1988 Porsche 959 Komfort that sold for $1,732,500. Gooding & Company has three auctions planned for 2016: Scottsdale Auctions on January 29 and 30, Amelia Island Auction on March 11, and the Pebble Beach Auctions on August 20 and 21.